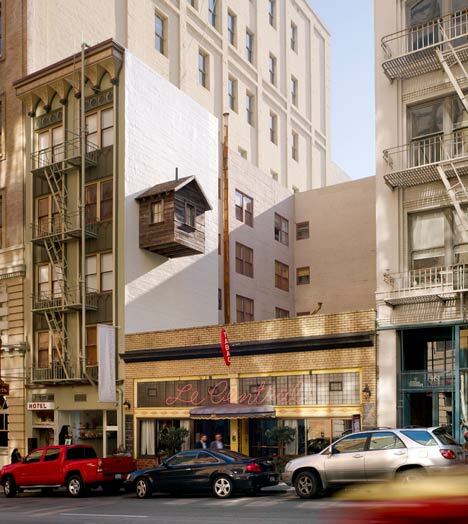 Artist Mark Reigelman and architect Jenny Chapman have built a wooden hut protruding from the side of San Francisco's Hotel des Arts as an installation they've titled "Manifest Destiny." Reigelman calls the project "both homage to the romantic spirit of the Western Myth and a commentary on the arrogance of the Westward expansion." Whether passersby will grasp the meaning is questionable, but it certainly would be an arresting site to see, particularly at night when light, powered by a solar panel on the hut's roof, streams through the curtained windows. It's an original project, to be sure, but I can't help but be reminded of other unexpected installations I've seen. It was my friend Sara of aqui who first introduced me to Theresa Himmer's sparkly grafitti. With the Mountain Series, which includes "Glacer #01" and "Volcano #01" above (I'm sure you can tell which is which), the Danish/Czech artist used sequins, plastic and plywood to interact with the cityscape of Reykjavik, Iceland. Pugh inserts human characters into his murals to highlight the 3D effect, and according to the Daily Mail, firefighters in Honolulu rushed to rescue the children in the top mural before realizing both children and wave were just an optical illusion. 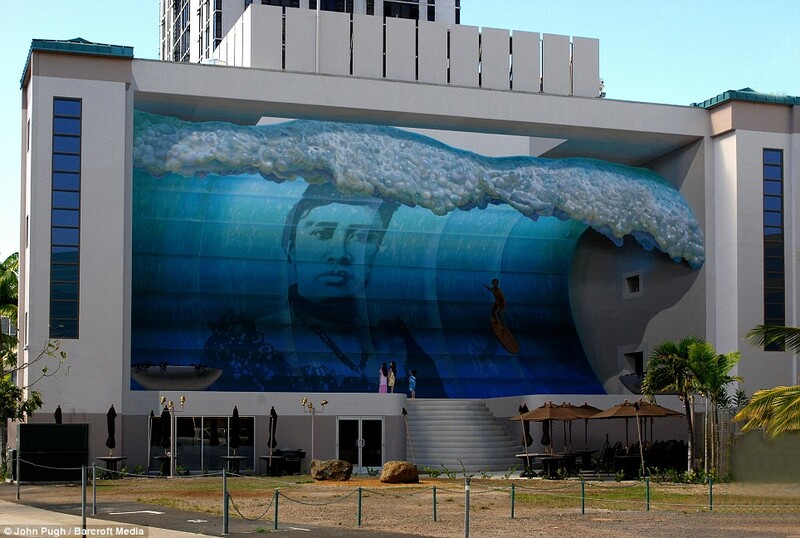 When 2-dimensional murals have become commonplace, why is it still so striking to see a building used as a canvas for 3-dimensional art? With space at a premium in urban environments (as "Manifest Destiny" points out) it's possible that more artists will turn to architecture when choosing installation space. But no matter how many buildings I see sprinkled with sequins or affixed with floating huts, I don't suppose I'll ever walk by without, at least, a double take. These are amazing, i'm going banana's for the Glacier!!! Plus the peek-a-boo hut/window is so cute! 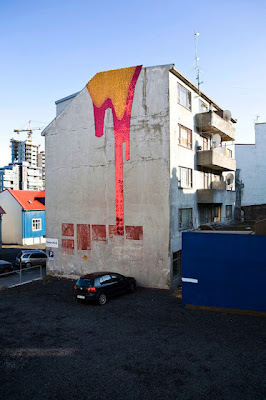 These projects (well, installations almost I guess) are all so cool! 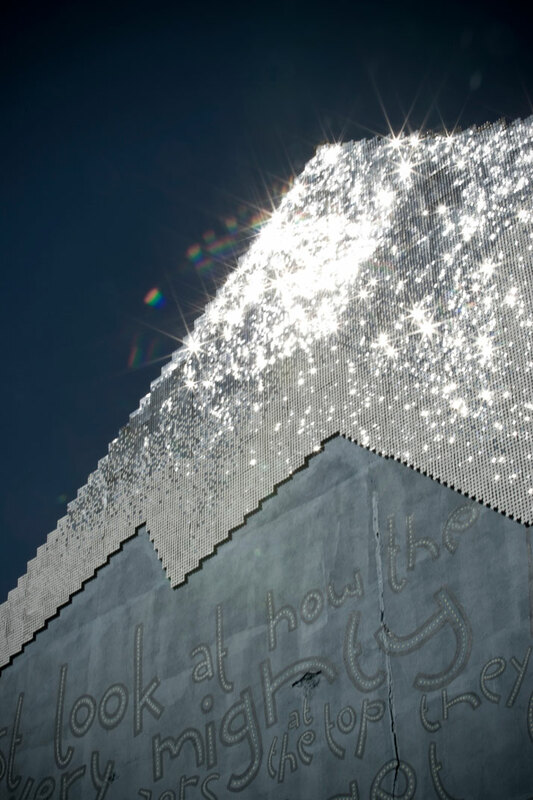 Oh I loved loved loved Sara's post on glitter graffiti. Wonderful choices of building art, friend. Thanks for the shout out lady! I am loving the little wooden hut on the side of the building! Really cool! And that wave? 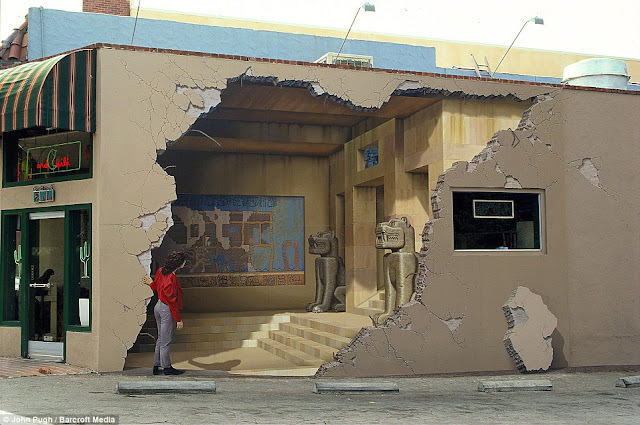 Its amazing what they can do with architecture! Love these! I actually just saw a picture of that log cabin somewhere, but without the explanation. The paintings remind me of the artist who does the 3D sidewalk chalk murals. Very cool - I love that glitter art! Wish we had that in my city. There's a chance you're eligible for a new government solar program.